Ottawa has gone from snow and sleet to heat almost overnight. It's the perfect weather for outdoor dining and high on the list for a hot summer evening in the National Capital Region is the beautiful screened porch at Restaurant Les Fougères in Chelsea. If you need to decompress after a stressful week at work, an evening at Les Fougères is like going to the cottage, without the long drive. Chef Charles Part trained in London, and began his stages there and in Paris. Press called him "one of Britain's top young chefs to watch" when he opened his first restaurant in 1979. 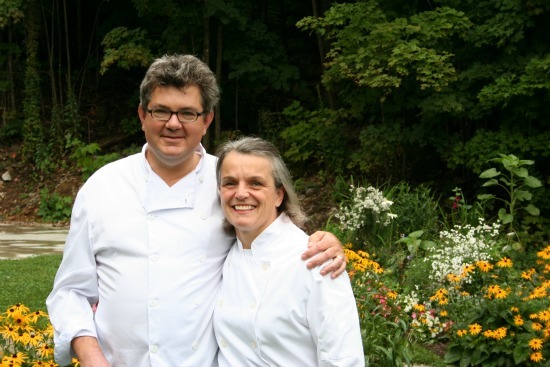 He moved to Canada in the early 80's, and by 1993 he and wife Jennifer followed their dreams, opening a countryside restaurant in the beautiful Gatineau Hills just north of Ottawa. Sustainable seasonal and regional cuisine is the focus, and the restaurant's gardens provide the kitchen with the freshest of vegetables, herbs and edible flowers. I recently nabbed a few moments of Charlie's time to learn more about how he got started and what drives his pursuit of local excellence. What started your love of cooking? My first food moment was waking up one summer afternoon from a nap as a very little boy. A window is open and the curtains are drifting in a warm breeze. My father has left a hunk of gorgonzola on the window ledge to chambré and the scent is overwhelming. Some kids might find the strong smell of blue cheese repelling, but for me that was it -- I became a slave to food smells from then on and that eventually led to a passion for cooking. Where and what was your first professional position? My first "stage" was at the Hotel Lancaster in Paris. I was a commis, the lowest rung on the cooking ladder, and spent months deep in the bowels of the hotel. I loved it. Over the years, you and Jennifer have won many awards, including more recently the University of Guelph's 2012 Good Food Innovation Award -- what award really stands out in your mind as a key achievement? We have been enormously proud and thankful for any awards. Winning the regional Gold Medal Plates Award and competing in Banff at the nationals was challenging and rewarding. The University of Guelph is doing amazing work to connect their agriculture and food development programs with end users -- humanity! Not just industry, including chefs and I have really appreciated their encouragement of heritage, sustainability and innovation. Support in our own locality has also meant an enormous amount to us. The thing that really stands out is that after 20 years there are still people coming, returning and enjoying the restaurant, gardens and adjoining store and we are still standing! We feel very fortunate. I know you attended the Canadian Chefs' Congress in Grand Pre last fall -- what's on the minds of you and your fellow culinary leaders these days? 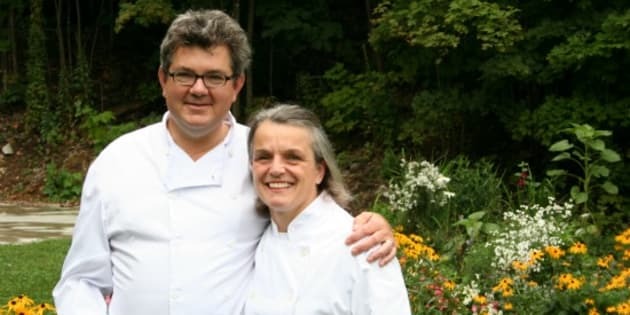 The discussions at the last Canadian Chefs' Congress were primarily around the viability of the family farm as an alternative to industrial style farming, concern over genetically modified foods and the responsibility and power chefs have to help promote sustainable agriculture and food systems. Home chefs are always interested in techniques that can help them improve -- do you have a tip to share with them? Avoid processed foods! Take time to thoughtfully smell and taste the foods you love. This will create a catalogue in your brain and a known goal for you to try to achieve in your own cooking based on experience rather than a recipe only. Trust yourself and your tastes. If you're creating something for you and your family, what would be the meal? Salad greens, freshly shelled peas, and herbs just picked from the garden; dressing made from yogurt, dill, freshly cracked pepper, a few chilli flakes, and olive oil; on top a "just caught" trout fillet pan-fried in butter, doused with crushed lemon and sprinkled with Maldon; crusty multigrain bread from ArtIsIn Bakery; lots of rosé; and MOST important -- family around the table. 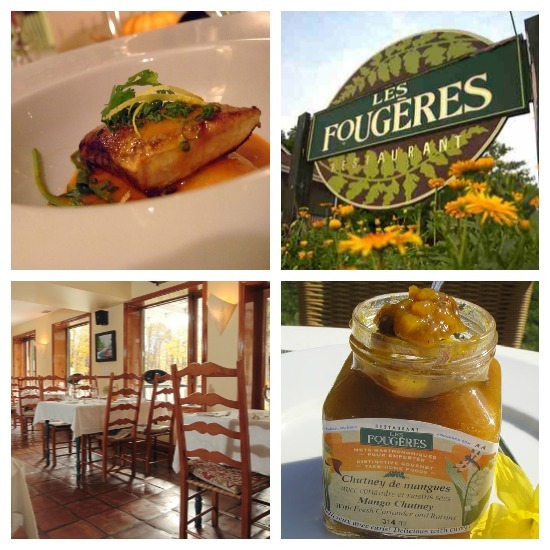 If in the National Capital Region, be sure to stop by Restaurant Les Fougères (and don't miss the Salad Fougères -- it's the best!). And if you live further afield, hand-made, kettle-cooked jams and chutneys from the Les Fougères kitchen are available on FoodiePages.ca. This month, Chef Charles Part also curates the FoodiePages.ca CHEF'S BOX, a delicious food of the month club that shares the favourite recipes and local food finds of Canada's best chefs.